No oil, no salt, just raw organic seaweed! We present the same nutritious & delicious seaweed used in our "Classic" SeaSnax and allow your inner chef to create a unique masterpiece. 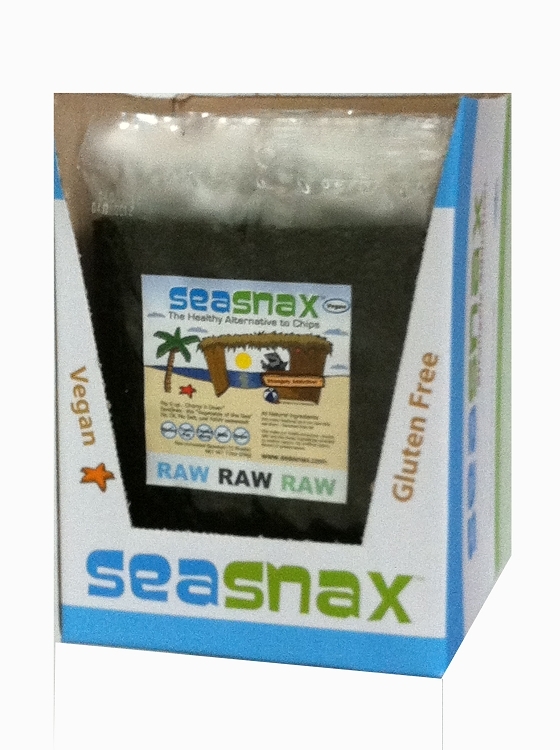 The SeaSnax Organic Raw case consists of 16 packs, each of which includes 10 sheets of raw un-roasted seaweed - rip'em up and chomp'em down! It's great just the way it is or you can throw your own California roll making party by adding rice, avocado and a sliver of mango! Be creative & try it with your favorite sandwich, soup or salad! Place all ingredients in a food processor and run motor till it’s relatively smooth. With motor running, drizzle in enough water for the pate to be thick, but easy to spread (careful not to add too much!). Cut a sheet of seaweed in half. Spread each half with two generous dollops of pate. Using a knife or spatula spread the pate in a thin, even layer over the seaweed. Beginning at the shorter end of the sheet, roll the seaweed carefully up to make a single rolls. Keep working with all of the seaweed until you’ve got about 8 or 10 rolls. Cut in halves and serve. Copyright SeaSnax. All Rights Reserved. eCommerce Software by 3dcart.